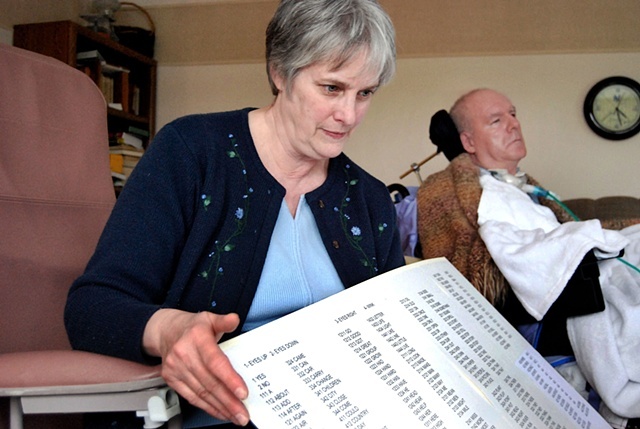 Bonnie Veillette, holds a board containing words that helps husband Bob Veillette communicate. Bob Veillette is a journalist living in Connecticut who suffered a massive stroke in April 2006 that left him with locked-in syndrome — a condition that leaves a person locked inside their body, paralyzed below the eyes but totally cognizant of the world around them. Bob Veillette continues to inspire me. When I worked for him at the Republican-American, he often lead newsroom meetings with his 'Good Deeds in a Naughty World' stories. He gave examples people's actions or responses to situations that went above and beyond what you'd normally expect. By using keen humor and perspective, Bob got the point across to staff, that what you do matters. Bob's words still matter and when I see his Facebook updates - they make me think, feel and know that the quality of life we live is within our own means. See annual Bob5k event and run for Bob and for yourself!